Compared to Pseudoeurycea leprosa, its nearest relative, Lineatriton lineolus (bottom), is ideally built for burrowing. Berkeley - A new species of salamander discovered in an isolated range of hills in southeastern Mexico highlights the agile inventiveness of evolution as well as the many species still waiting to be discovered in out of the way spots and even under our noses. The soil dwelling salamander looks identical to a salamander living in mountain foothills several hundred miles away, but DNA analysis by zoologists at the University of California, Berkeley, showed them to be distinct species. Experts can't tell them apart, but they apparently evolved from different ancestors and are not one another's closest relatives. The finding, reported this week in the online edition of the Proceedings of the National Academy of Sciences, demonstrates an evolutionary concept called parallelism, a situation where two organisms independently come up with the same adaptation to a particular environment. The discovery is one of many surprises that have emerged in the past few years as biologists use DNA comparisons to distinguish species and chart family trees. More and more researchers are finding that what once were thought to be separate populations of the same species are, in fact, different species or lineages, each as genetically distinct as a horse from a cow. "Biodiversity has been grossly underreported," said David Wake, professor of integrative biology at UC Berkeley and co-author of the PNAS paper with former graduate student Gabriela Parra-Olea, now a postdoctoral fellow at the Museum of Comparative Zoology at Harvard University and soon to take up a post at the University of Mexico in Mexico City. This unsuspected diversity, often termed "cryptic biodiversity," is turning up in everything from whales to birds, fungi to flowering plants. It has implications for those who keep track of species, such as those who enforce the Endangered Species Act, as well as for biologists attempting to assess diversity in a particular region. Plus, it raises questions about the preservation of biodiversity. "In biology, we have been too conservative about recognizing new species," said botanist Bruce Baldwin, curator of the Jepson Herbarium at UC Berkeley and a professor of integrative biology. "The general practice has been, if you can't tell members of different lineages apart by eye, then you shouldn't treat them as different species. But if we lump them all together, that under-represents biodiversity, and evolutionarily distinctive populations will not receive the protection afforded to other groups." Wake, a recognized expert on amphibians, especially salamanders and frogs, is turning up new species seemingly under every log. Even in areas that supposedly have been combed thoroughly - Yosemite and Sequoia National Parks in California - Wake and his colleagues are finding new species as part of a survey commissioned by the National Park Service. Wake and his students also have found amazing variation within what once was considered a single species. The California slender salamander, Batrachoseps attenuatus, the most common salamander in the state, turns out to be 20 separate species spread out along the coast from Oregon to Mexico. In 1997, he found one new species in the San Gabriel Mountains outside Los Angeles, and last year found another in San Simeon. Similarly, a biologist at the University of Maryland discovered after DNA analysis that the common slimy salamander of the eastern U.S., Plethodon glutinosus, is really 16 distinct species. "Evolutionarily, these are distinct species, without question," Wake said. "They don't mate with one another, and they live in totally different geologic and ecologic areas." Wake said that the number of known salamanders is increasing by two percent - nearly 100 new species - every year. Ornithologists have found similar cryptic biodiversity in crossbills, herpetologists in reptiles, marine biologists in whales, and botanists in plants, such as the tiny yellow goldfields that used to blanket the hills of California every spring. "In case after case, when we look at evolution at shallower levels than we possibly could before, we are finding groups that have undergone extensive divergent evolution while remaining morphologically indistinguishable," said Baldwin. One of his graduate students is doing the work on goldfields. The current PNAS paper deals with a particular genus of salamander, Lineatriton, that is unique among salamanders in how it has adapted to living in the soil of the forest floor. To facilitate burrowing, all other soil-dwelling salamanders became long and slender by developing more vertebrae in the neck and back, and by shrinking their legs. Rapid burrowing makes it easier to escape predators, Wake said, enabling salamanders to move into lowland habitat. 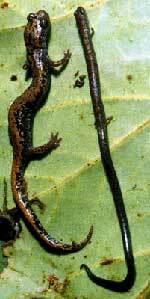 Lineatriton is the only salamander to become long and slender by taking a tip from the giraffe - it grew longer vertebrae. Only one species, Lineatriton lineolus, had been recognized in the genus, and it lives in the foothills of mountains inland of the Veracruz coast, between 2,000 and 4,000 feet. When Parra-Olea collected identical salamanders from a known population in an isolated series of hills known as Los Tuxtlas farther down the coast, she naturally assumed they were of the same species. Analysis of their mitochondrial DNA revealed, however, that they were two separate species that just happened to find the same solution - slim down and stretch out - to the problem of burrowing. Apparently, they evolved from similar ancestors with a more general salamander body plan characterized by a tail about the same length as the body. "We were so surprised we did the DNA analysis again," Wake said. "These salamanders developed in parallel the same mechanism for burrowing in the soil, by lengthening their vertebrae - a strategy we thought had evolved only once in salamanders." Interestingly, the Lineatriton genus and a more widespread soil-dwelling salamander of the tropical lowlands, Oedipina, evolved different ways to invade the soil, what biologists call convergence. While Oedipina developed more vertebrae - expanding from 14 to 18-22 vertebrae between the head and tail -Lineatriton kept the same number, 14, but grew them longer. Both have tails that stretch nearly twice the length of the rest of the body. Wake and Parra-Olea found from their DNA analysis, which included many of Mexico's tropical lowland salamanders, that Lineatriton and Oedipina are not closely related either. "These findings give us insight into the patterns of convergent and parallel evolution and how lineages diversify," Wake said. "Without new molecular techniques, this would have been impossible." The work was supported by the National Science Foundation, the National Geographic Society and Mexico's Consejo Nacional de Ciencia y Technología (CONACyT).